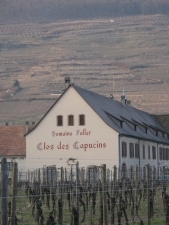 According to local history, Clos des Capucins (5 acres), protected by the walls of the former Capuchin monastery, dates back to 890, when Empress Richarde donated this monastery to the abbey of Etival, which in turn is a part only used by the Capuchin monks. At the foot of the majestic Schlossberg hill, bathed in an abundance of vineyards and rose gardens, Domaine Weinbach, built in 1612 by the Capuchin monks, was named after the small stream flowing through it. The careful vinification is achieved by respecting the unique qualities of the grape, a minimal intervention, but with extreme vigilance. The main conditions are: a delayed harvest until they are fully ripe, rigorous selections, soft and progressive pressing and long fermentation in old oak barrels. All these factors contribute to the authenticity and complexity of the wines. The richness and variety of mineral soils, the personality of each grape variety, the suitability of the site and the bottom, the individuality of each parcel or group of parcels, give way to a very wide range of wines. Each has its character, its own colour, always with the same quest for purity, elegance combined with richness and balance. This resulting in beautiful, high quality and very suitable gourmet wines. The quest for quality is always achieved by the combination of the following: The rich soils, each with their own exceptional geological features, a dominance of topological rolling vineyards and climate, with the best sun contribute to the microclimate of the valley of Kaysersberg. Vendanges Tardives, Selection de Grains Nobles and Quint Essence de Grains Nobles are another manifestation of this beautiful region, reinforced by the overripe grapes and botrytis. These wines are exceptional, remarkable for their aromatic complexity, their concentration and their rare perfect balance. Vendanges Tardives can be appreciated on its own. A terrine of foie gras is superb with a Pinot Gris or Gewurztraminer Vendanges Tardives. Gewurztraminer will also do wonders for oily and strong cheeses. Riesling Vendanges Tardives is a rare success, an alliance of exuberance and elegance. Selections de Grains Nobles are obtained by sorting the berries affected by noble rot. These are real nectars, dense and balanced gems. The Quint Essence de Grains Nobles are extremely rare by their very small productions in just a few wines. 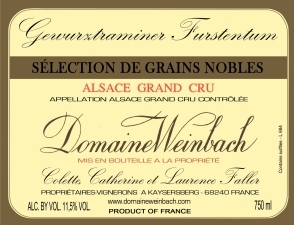 The name of Quintessence at Domaine Weinbach was first created in the harvest year 1983. With its steep slopes to the south, the castle is built on terraced slopes. This place is very famous and dates from the fifteenth century. This is the first Alsace Grand Cru since the decree of 1975. The Schlossberg is an exceptional terroir for Riesling, with a very pure expression of fruit with a unique finesse. The Schlossberg Cuvée wines, lively and elegant, from the top of the hill, with shallow soil. 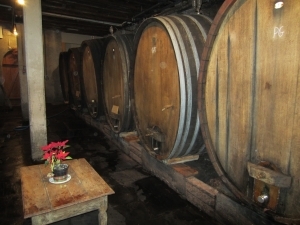 The Cuvée Sainte Catherine, located in the lower part of the Schlossberg, is characterized by very rich and fuller wines. Riesling Schlossberg Cuvée Sainte Catherine comes from very old vines located halfway up the slope and fully illustrates the beauty of this area. All these factors make the wines of Domaine Weinbach what they are today, showing off in the best restaurants in the world and representing Alsace in many countries. Showing how the wines of the region are of extraordinary personalities, aromatic, rich and extremely subtle, an inexhaustible source of inspiration in combination with food.